Kolstein Rosins are specifically formulated for the upright bass, offering strong, even adherence, long lasting power, and extremely low powdering. It has an indefinite shelf life made possible by a continual wetting agent in the formula which prevents crystallization, permitting easier application and minimum powdering while playing, and also prevents the rosin from drying out with age. Kolstein's Formulation Supreme Bass Rosin has corrected this problem. Through much tedious research and experimentation, the results has produced the Kolstein Rosins specifically formulated for the standup bass and for individual players needs. For the bassist, there is an option of hard, all weather or soft grade to accommodate personal needs. adhering to a required minimum curing period for predetermined time. Packaging design for Kolstein's Formulation Supreme Rosin has been created with the musician's convenience in mind. The Kolstein Bass Rosin has just gone through a most impressive redesign in packaging. It now is contained in a roll-down silicon cup, allowing the bassist to easily roll down the cup to expose rosin for application - then allowing the player to roll up the cup to protect the bass rosin while being stored. 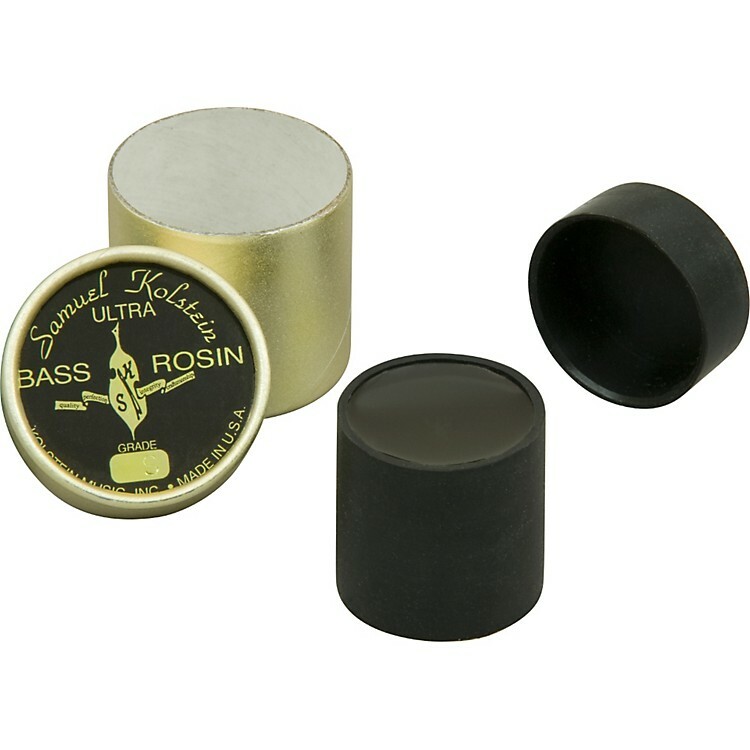 Truly an amazing design¦ makes the Kolstein Bass Rosin even greater than ever and more desirable. Kolstein's Formulation Supreme Bass Rosin has truly answered the need of the discriminating player who is striving for a specific formulation of rosin to compliment their bow and instrument, offering strong, even adherence, long lasting power, extremely low powdering combined in a richly textured blend of rosins. With the disappearance of the fine old rosin makers of past years whose rosins were held in high esteem, and the elevated achievements in playing capabilities, there has been a great need to fulfill the requirements of the more discriminating musician. Kolstein's Formulation Supreme Bass Rosin, the result of over forty years of dedicated research and development for the professional players' needs, has recognized this void and is supplying the player with a rosin of greater and more even adherence, longer lasting power and superior packaging. As with all Kolstein's Formulation Supreme Bass Rosin, the musician will attain a rich, tonal quality, unlike other rosins which have a tendency to be gritty and gum up the bow hair in certain geographical and climatic conditions.